Dr Dan is a registered specialist in paediatric dentistry. As a youngster, Dr Dan grew up on the land in southwest Queensland. He rarely wore shoes, he helped with the shearing, and he loved swimming in the river. At the completion of his schooling, he attended The University of Queensland where he gained an honours degree in Science and Dentistry. The former included research into the digestive system of the saltwater crocodile, and involved regular expeditions to catch and examine the snappy reptiles. After completing his university studies, Dr Dan served in the Royal Australian Air Force, reaching the rank of Squadron Leader. He left the Air Force to specialise in paediatrics. His specialty training was undertaken in Queensland and included extensive research in the area of enamel hypoplasia. He has published internationally in his field. 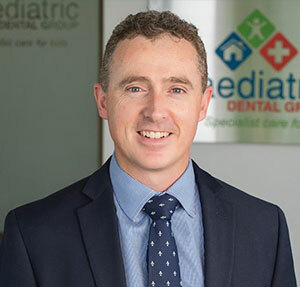 As a specialist in Paediatric Dentistry, Dr Dan provides comprehensive care, with special interests in inherited and acquired developmental conditions (including enamel hypoplasia), paediatric oral surgery, trauma, dental treatment for medically compromised children and management of oral disease during early childhood (including early childhood caries). He consults and treats in Brisbane, Toowoomba and the Sunshine Coast, and is a visiting specialist at various hospitals, including the Mater Children’s Hospital, St Andrew’s Hospitals, and Sunshine Coast Private Hospital. Dr Dan also lectures in Paediatric Dentistry at The University of Queensland and Griffith University. Dr Dan and his wife have four young children. He enjoys all things family, tennis, running and lots of playing the guitar badly!